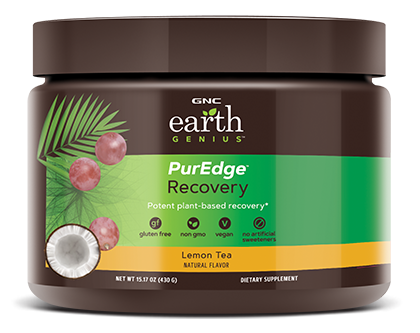 Support your body with GNC Earth Genius™ PurEdge™ Recovery. Replace electrolytes lost during your workout with ingredients in this fermented, vegan BCAA blend. *A study including 20 high-level athletes in training and competition were evaluated on two separate occasions. On one occasion they used PowerGrape™ whole grape extract and the second occasion they took a placebo. Results concluded a 10% improvement in antioxidant levels in the blood when they took the PowerGrape™ whole grape extract compared to the placebo, revealing better antioxidant support. PowerGrape™ is a trademark of Naturex. Add one scoop to 12 fl. oz. of cold water after your workout and mix thoroughly. Consume any time throughout the day on non-training days. Significant product settling may occur. Keep out of reach of children. Store in a cool, dry place. recover from the ground up. support your body post-workout with plant-based PurEdge Recovery. what makes it genuis? Unlike popular recovery drinks, PurEdge Recovery does not have artificial colors, flavors or sweeteners. This drink blends a botanical extract and plant-based ingredients with fermented vegan BCAA to support recovery. I started using this supplement recently. I was very happy to find a BCCA workout recovery product with a clean label. So many products are filled with artificial colors, sweeteners and other chemicals that just are not necessary and probably aren't healthy. So far, so good.